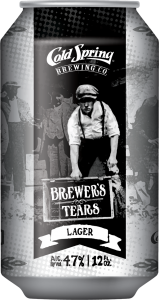 COLD SPRING, MN – Cold Spring Brewing Company and Third Street Brewhouse are pleased to announce the release of their latest brew and first in their Historic Series, Brewer’s Tears. Brewed from a handwritten recipe found hidden in the brewery’s archives, Brewer’s Tears is a pre-prohibition lager with 4.7% alcohol, perfect for reminiscing and having your own sip of history. Cold Spring Brewing Company was founded in 1874 by German immigrant Michael Sargl as he began brewing beer outdoors in a kettle. 16 years later in 1890, John Oster became a brewery partner, bringing new machinery to the brewhouse. Sargl and Oster continued brewing beer until the eighteenth amendment to the Constitution was ratified in January 1919 ushering in the era of Prohibition. All across the country, breweries were forced to pause production and dispose of their alcohol. Federal agents arrived at Cold Spring Brewing Company and ordered all the beer be poured into the creek. The brewery owners stood by stoically watching this tragedy. Brewmaster Hermanutz walked away with a tear in his eye, unable to watch his work be destroyed. 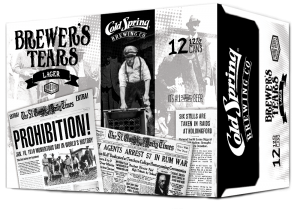 Luckily, Cold Spring Brewing Company was able to shift their focus to producing mineral water and near beer until Prohibition ended and they could return to brewing their full beer production. Cold Spring Brewing Company and Third Street Brewhouse have found Brewer’s Tears to go well with chicken salad, fettuccine in cream-based sauce, fish, white rice, garlic potatoes and buttered rolls.